Cape Town - The Salvation Army, together with Saatchi & Saatchi Cape Town, has set out to lift the veil on child trafficking with an innovative outdoor campaign to inform the unknowing South African public about the severity of human trafficking, the fastest growing criminal industry in the world. 1.2 million children are trafficked each year and it's estimated that these numbers will rise dramatically in 2010. The International Organisation for Migration (IOM) contends that globally human trafficking has an annual turnover of US$32 billion, making it the third most lucrative criminal activity after the narcotics and weapons trades, although in contrast to these other criminal activities, the penalties for human trafficking in most countries are much less severe, or non-existent. Major Marieke Venter of The Salvation Army says, "Modern day slavery 'works' and thrives because of its great profitability. This industry is continuously growing because of the high demand, ease of supply and lack of awareness. That coupled with the absence of effective laws will allow this industry to continue without much resistance." Ian Young, Managing Director of Saatchi & Saatchi Cape Town says, "We decided that an unusual approach would work in generating the much needed awareness around this issue," he adds. "We took an ordinary toy crane machine, gave it a sinister twist and created a new game called 'Little Treasures'." He says that the machine was filled with cute dolls, wrapped in seemingly innocuous illustrations and then placed in a popular shopping mall on a busy morning. "People of all ages were instantly drawn to the innocent looking game and the treasures within. 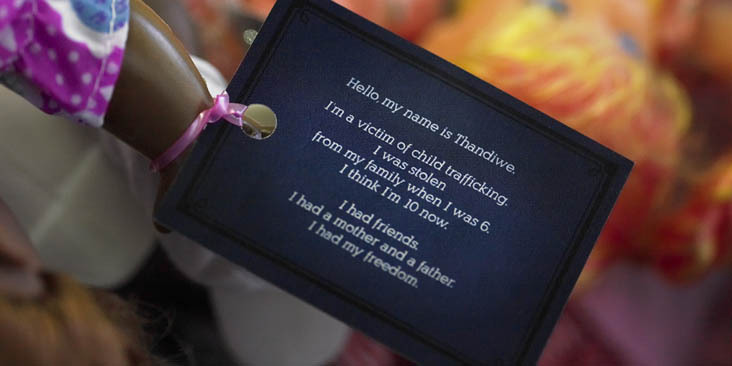 After playing and snatching a prize, the truth was revealed via a message attached, that each doll represented a child lost to the business of human trafficking." He stresses that the media in South Africa is the most powerful medium of communication to the diverse cultural groups in SA. "With this in mind, this week we launch the mechanism of this campaign to the top media houses in South Africa to create the awareness right at the core of communication." "We are excited that the media are willing to get involved in this campaign and trust that they will give this issue the presence it deserves," he adds. This is interesting. I'm not familiar with what outreach and awareness activities would resonate with the South African audience, but the tactic is creative. Since games like that obviously target children, I'm not sure if children would understand the very deep and upsetting message attached to their dolls. Although hopefully parents could use it as a stepping point to either learn more themselves or start a conversation with their children about protecting themselves. My immediate reaction is conflicting - I'd be interested to see if the Salvation Army or Saatchi & Saatchi plan to do some sort of evaluation after they're done with this effort to see how effective it was.